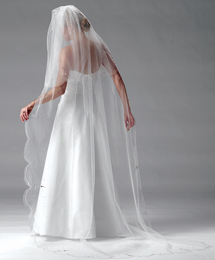 Description: Cathedral length veiling on hidden comb with blusher. Scattered beads accent the embroidered and scalloped cut edge veiling. Accessories: Also available in finger tip length.